← TREVOR COBBOLD. New figures show States have cut funding to public schools. LUCY BERAUD-SUDREAU. 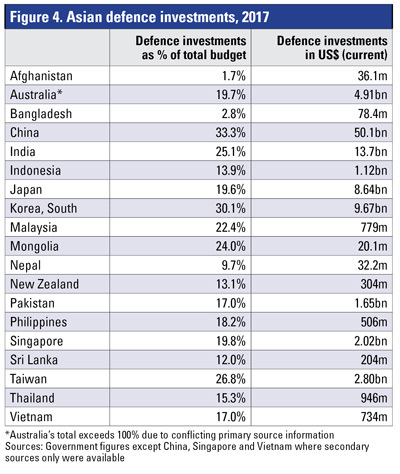 Asia’s defence budgets dispel ‘arms race’ myth. 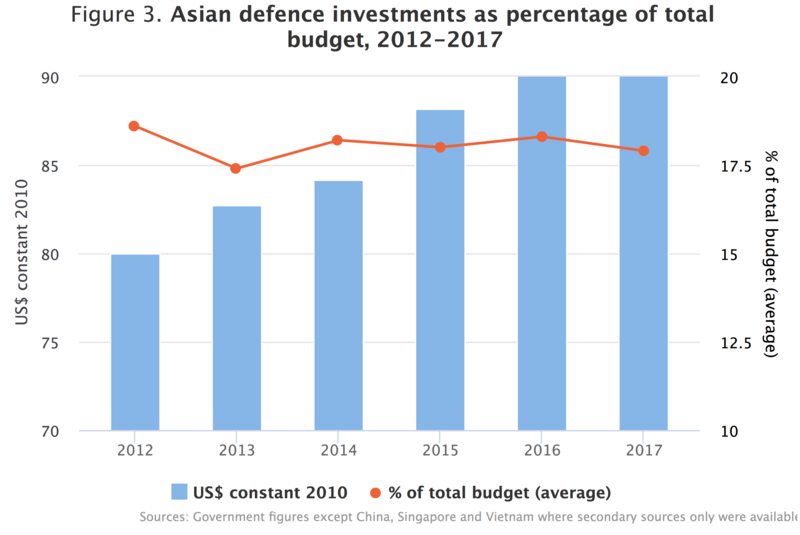 Asian defence spending has not grown faster than the region’s economies – and the share of defence budgets allocated to procurement and R&D has held steady over time. 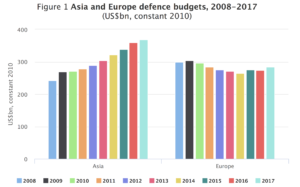 Asia’s substantial defence-spending increases saw it overtake Europe as the second-largest defence-spending region in 2012. This has encouraged some to label the Asian regional arms dynamic as an arms race. However, a close look at the numbers refutes this argument. First, defence spending in individual Asian countries has not, in aggregate, been growing faster than those nations’ economies. This indicates that defence has not been disproportionately favoured over other areas of expenditure. In addition, the proportion of defence spending dedicated to procurement and modernisation has stayed constant in recent years. Data also supports the argument that weapons purchases have neither an excessive nor increasing priority in the region. Since 2012, Asia as a whole has spent more on defence than European countries, when measured in real terms. However, the pace of growth slowed down in 2017. While the annual growth rate was more than 5% between 2013 and 2016, this contracted to between 2% and 3% last year. This downturn could reflect the end of a military-modernisation cycle that began after the 1997–98 Asian financial crisis. This cycle brought new capabilities to regional armed forces, including those provided by a new generation of stand-off and precision-guided weapons (AGM-142, JDAM, JSOW); improved intelligence, surveillance and reconnaissance (ISR) from airborne early-warning and command aircraft and uninhabited aerial vehicles (UAVs); and enhanced power projection (through new submarines, and large aviation-capable ships), to name but a few. Such developments are particularly evident in the case of China. An alternative explanation is the imposition of temporary economic constraints, despite the continuation of overall regional economic growth. If this hypothesis is correct, then stronger defence-spending growth should pick up again in the short term. 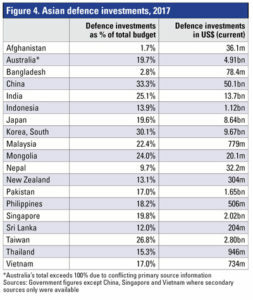 Southeast Asian countries, in particular, have moderated their defence-spending growth or implemented cuts in their defence budgets. This is mostly the consequence of the global trade slowdown of recent years, and the impact of commodity-price falls on government spending. For example, Malaysia’s defence budget fell by 15.9% in real terms from 2016 to 2017, after a decline of 4.5% from 2015 to 2016. Economic constraints evidently played a role; low commodity prices from 2014 to 2017 impacted government revenue. In this fiscally constrained environment, Malaysia’s re-equipment plans for its armed forces have stalled. After years of double-digit defence-budget growth rates, since 2016 China’s defence budget has fallen into line with GDP growth of around 6–7%. This almost certainly does not signal any weakening in the political commitment to develop Chinese military capabilities, a recurring theme in the speeches of leader Xi Jinping. Rather, it represents an adaptation to slower economic growth. The recent trajectory of defence spending seems to have been influenced primarily by economic conditions, apart from in Japan and South Korea, which are motivated by their concerns over the threat posed by North Korea. Although Asia is the world’s strongest economic region, nations still face temporary economic constraints and may check public spending. This includes checks on defence budgets, which are only one of many public priorities such as health or education. Hence, since 2010, Asian countries in general do not appear to have prioritised defence spending particularly: the share of aggregate GDP across Asia dedicated to defence has not risen significantly over the past decade, fluctuating around 1.4–1.5% between 2008 and 2017. 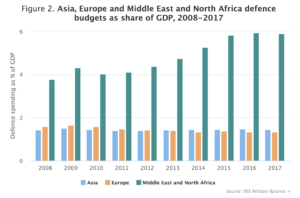 By comparison, European spending as a share of GDP varied between 1.3% and 1.5% in this period, and the Middle East and North African countries between 4 and 5%. Analysis of budget breakdowns also shows that defence investments (i.e. procurement and research and development [R&D] spending) have remained stable over time. This shows that, despite modernisation efforts, procurement has not been excessively prioritised over other expense categories such as personnel or maintenance. Indeed, IISS research shows that, although there is an increase over time in aggregated Asian defence-investment budgets, the average share of defence investment in total budgets appears fairly constant at around 18%. This proportion was, however, lower in 2017 (17.9%) than it was in 2012 (18.6%). For comparison, NATO expects its members to dedicate 20% of their defence budgets to procurement and R&D. Within this aggregate picture, China is by far the biggest spender on procurement, with an estimated US$50.2 billion expended in 2017, accounting for over 50% of total regional defence investments. However, it should be noted that this figure is heavily based on a rule-of-thumb estimate. China’s 2010 defence White Paper claimed that equipment expenses, including R&D, represented one-third of the total defence budget. This was confirmed in China’s most recent report to the United Nations Military Expenditure database in 2013. The Chinese government has not released additional information on the sectoral allocation of defence spending since then. The next three largest spenders on defence equipment and R&D by volume in 2017 were India (US$13.7bn), South Korea (US$9.7bn), and Japan (US$8.6bn). These are also Asia’s biggest overall defence spenders behind China. While this suggests India is one of the main spenders in terms of defence investments, the figures could be misleading. Observers have noted that recent rises in India’s overall defence budget have been dedicated to covering the costs of pension-benefit increases (as a result of the country’s ‘One Rank, One Pension’ reform). This is reflected in the available data, which shows a decline in the proportion of the budget dedicated to defence investments from 33.6% in 2012 to 25.3% in 2018. Moreover, in 2017 the declining proportion of the defence budget allocated to procurement and R&D was entirely spent, for the first time since 2010. For instance, the planned 2016 budget for capital outlays (procurements) was INR785.9bn (US$11.7bn), but the actual expenditure for that year was only INR717bn (US$10.7bn); so given that INR716.8bn (US$10.9bn) was spent in 2015, capital outlay was effectively stagnant. The planned INR864.9bn (US$12.6bn) for capital outlays in 2017 may also not be fully spent. 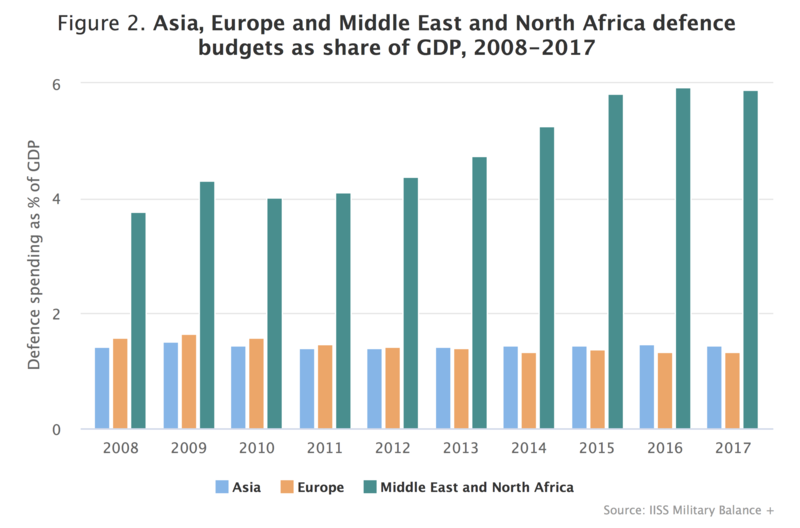 Given the pace of economic growth in the region, Asia’s headline defence budgets haven’t increased disproportionately and the share of defence spending dedicated to defence investments (i.e. equipment modernisation) has remained stable. A close examination of the relevant data dispels the often-heard and dramatic argument of an ‘Asian arms race’. This article was first published by IISS on the 30th of May, 2018. Lucy Béraud-Sudreau is a Research Fellow for Defence Economics and Procurement. This is an edited extract from the forthcoming Asia-Pacific Regional Security Assessment, which will be released at the IISS Shangri-La Dialogue on 1 June.